Capsicum chinense growing shrub‎ of the genus Capsicum also known as Chinense pepper, Capsicum chinense perennial evergreen but can grow also as annual plant and also used as ornamental plant, can grow in tropic, subtropical, mediterranean, temperate or desert climate and growing in hardiness zone 10b+ as perennial 2+ as annual. 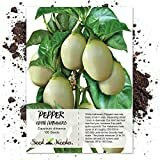 What can be done with big quantities of Capsicum chinense fruits? 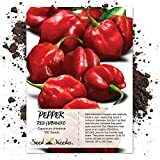 Carolina Reaper – is a red pepper considered to be the world’s hottest chili, averaging 1,569,300 on the Scoville heat scale with peak levels of over 2,200,000. Habanero – a well-known chili pepper from mexico with scoville heat units ranging from 100,000–350,000. 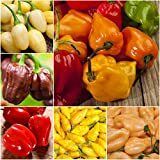 Habaneros come in all sorts of colors varying from Common colors such as orange, red and less common ones such as white, brown, pink, mustard, and others.The hottest Habanero to date is the Red Savina pepper with a score of 577,000 units on the Scoville heat scale. Scotch Bonnet – a chili pepper found mainly in the Caribbean islands with similar ratings to its cousin the Habanero. 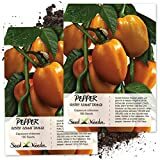 Some Scotch Bonnet’s have a sweeter more unique flavour than Habanero’s which makes them ideal for Caribbean dishes. Fatalii – A yellow chili pepper that originates from central and southern Africa. It has a fruity, citrus flavor and heat levels comparable to the Habanero. 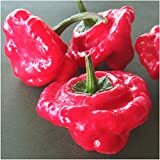 The Scoville Food Institute lists Fatalii to be the seventh hottest pepper in the world with heat levels ranging from 125,000 to 400,000 Scoville units. 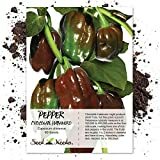 Trinidad Moruga Scorpion – Is an exceptionally hot pepper that was recognized as the hottest chili pepper in the world in 2012 with Scoville heat units of more than 1.2 million to 2 million SHUs. It was recently dethorned by the Carolina Reaper.